Learning to love myself one blog post at a time. Have yourself a merry little Jewmas! Aah, the Christmas season – families decorating their tree, chestnuts roasting on an open fire, leaving cookies out for Santa and some carrots for Rudolph and his reindeer friends. Christmas is about togetherness, it’s about love, and it’s about celebrating the birth of the Baby Jee. But what about us lonely Jews? This is NOT Jewmas - this is just wrong. We get none of that. No tree. And let me stop you now – don’t even try to pull that Hanukkah Bush bs on me. It’s a lie. There were no trees in the desert. There was one bush, and it burned. Thanks Moses, way to cockblock our holiday fun. Yes, we do have eight nights of presents, but really, once you’re older then say 8 years of age that gets thrown out of the window too. Parents start to pull this “one present for all of Hanukkah” crap once they realize that you’re on to them. There’s no mad rush at the crack of dawn to some glorious present-wielding foliage. NO. Once present, a night and not until AFTER candle lighting and praying and general Jewishness. NOT ANYMORE MY FRIENDS. Meet Jewmas: A Nondenominational Jeebus free celebration of a Christmas-like nature. Yes friends, Brooke and I have invented a holiday that combines the best of both worlds. 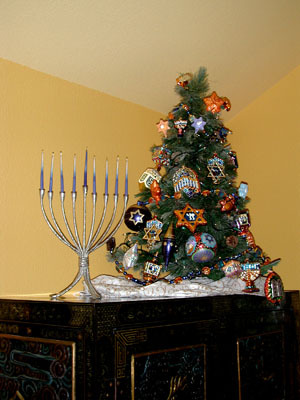 You can still light the menorah with the best of them in early December, and now, with Jewmas, you can also fully appreciate the beauty of the Xmas tree. Jeebus didn’t have one, and neither do you, but now that won’t prevent you from ogling the shiny. Jewmas is a truly secular celebration. Make a special meal, have a holiday cocktail. Maybe watch A Christmas Jewmas Story on the TV. Whatever you want, it’s your new holiday to do with as you please, and that’s the true joy of the Jewmas. It’s by Jews, for Jews, and for you (if you’re not Jewish)! For Jewmas 2009 (the Inaugural Jewmas) Miss B and I will be gathering in the fabulous city of New York (at my home) with my two kitties. There are big plans: the tree at Rockefeller Center, ice skating in Central Park, cookie baking. More cookie baking! Also, we’ll be baking cookies. There might also be peppermint fudge. Jewmas is really about the food. And friends. And fun. Just like Christmas, but without the nativity scene. If that’s a little too much, feel free to take baby steps: watch the Macy’s Christmas Parade, or eat a tree shaped cookie. Or, if all else fails, celebrate old school: Chinese food the movies. ‘Cause that’s what‘s open. What’s most important is that you embrace the holiday spirit and create for yourselves a little Jewmas miracle. From the both of us, Happy Christmas and Merry Jewmas! MWAH! ~ by BrookeLockart on December 24, 2009.
and we love you D! wish you were here with us. Yay, Stagey! This is a lovely idea, and I fully support it- I will make special effort to keep Jewmas in my heart this holiday season, and also will take some peppermint fudge. Thanks. Haha- Merry Jewmas! p.s. Ms. Brooke, I do not know thee (but as a friend of Stagey, you are surely awesome, just as I : ) – just wanted to say I think your blog looks so pretty… love the pic and the falling snow- so cool! Aww, Stagey and I are about to go eat some cookies mmmm… and thanks for checking out my blog! Hi Brooke! I am new to your blog– I admit I found your link on LTT and then I got sucked in with the beautiful header and your beautiful words. I also think I’m kind of obsessed with bloggers from PA because I spent my childhood there and I miss it. Wonderful blog, I hope you won’t mind if I stop back by from time to time. Merry Jewmas to both you and Noodle! Welcome and please do come back! And nothing wrong with finding my link through LTT, that’s why it’s there! Merry Christmas! I'm a little Amelie (Le fabuleux destin d'Amélie Poulain), but with less adorableness and more snark. Part die-hard Penn State fan, part girly girl, part adventurer and the rest...magic.